As a regular school tuck shop and bakery staple, the meat mince pie has filled my belly countless times. Sometimes the pastry is too hard, sometimes there’s a lot of gravy and not very much else, sometimes I feel as if I’ve just eaten a giant ball of fat. Crispy golden pastry that gives way to a flowing, molten gravy of well-seasoned mince – that’s what a mince pie should be like. Once eaten, it should sit comfortably in the stomach, leaving only crumbs of pastry and a warm, satisfied smile on your face. That’s what I was aiming for when I made my mini mince pies but unfortunately I missed the mark slightly. Heat oil in a medium frying pan over medium heat. Add onion and garlic and cook, stirring, for 2 minutes or until onion softens. Add the mince and cook, stirring with a wooden spoon to break up any lumps, for 5 minutes or until mince changes colour. Add the carrot and stir until well combined. Meanwhile, place gravy powder in a heatproof jug. Add boiling water and whisk with a fork until combined. Add to mince mixture and cook, stirring, for 2 minutes or until sauce thickens slightly. Remove from heat. Cover and set aside for 30 minutes to cool. Preheat oven to 180°C. 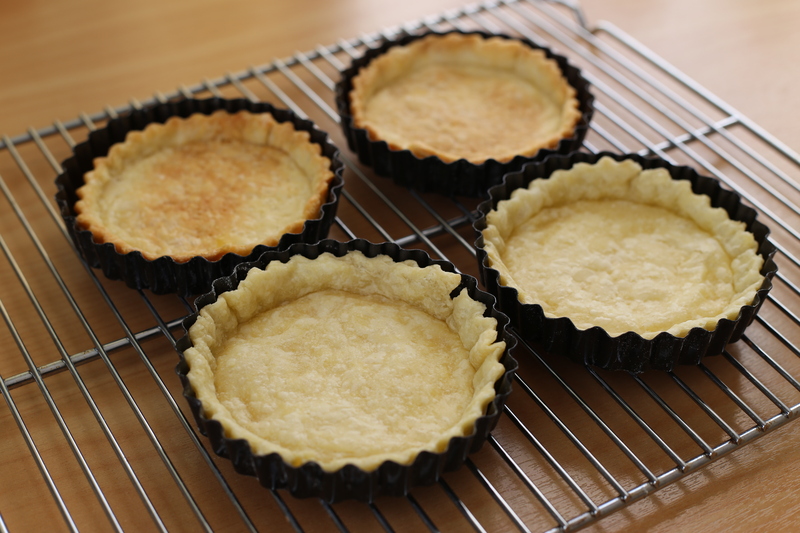 Cut the shortcrust pastry sheets into 24 even squares. Line twenty-four 40ml (2-tablespoons) capacity mini muffin pans with the shortcrust pastry squares. Spoon mince mixture among pastry cases. Cut puff pastry sheets into 24 even squares. Top each pie with a pastry square. Use a small sharp knife to trim excess pastry. Brush tops with egg. Bake in oven for 20 minutes or until golden brown. Remove from oven and set aside in the pans for 5 minutes to cool. Serve pies with tomato ketchup. 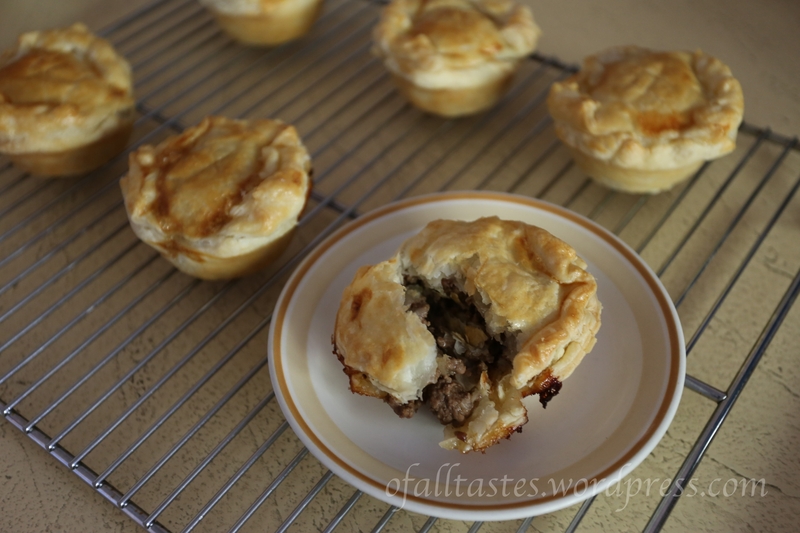 The filling of my little pies turned out a bit under-seasoned and very dry (no flowing molten gravy of mince here), which was probably caused by my adjustment of the recipe. It also lacked the wonderful depth of flavour I found when I made a Guinness and steak pie last Christmas. 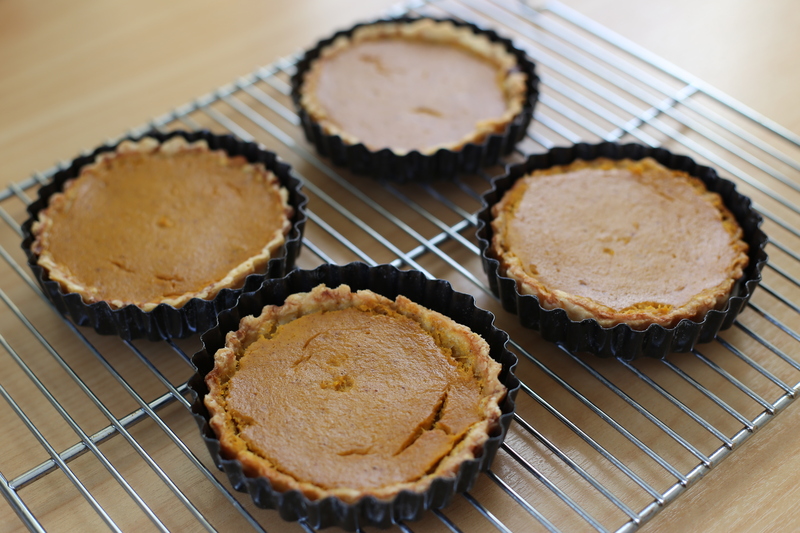 Last week my parents bought a pumpkin and said, “Tao, make something out of this.” I said, “Soup?” They said, “No…” I said, “Pie?” And they said, “Yes!” From my last experience making pie, I knew it was going to take forever, or at least the whole day, so I chose to attempt it at the beginning of my two-week break before uni starts again. 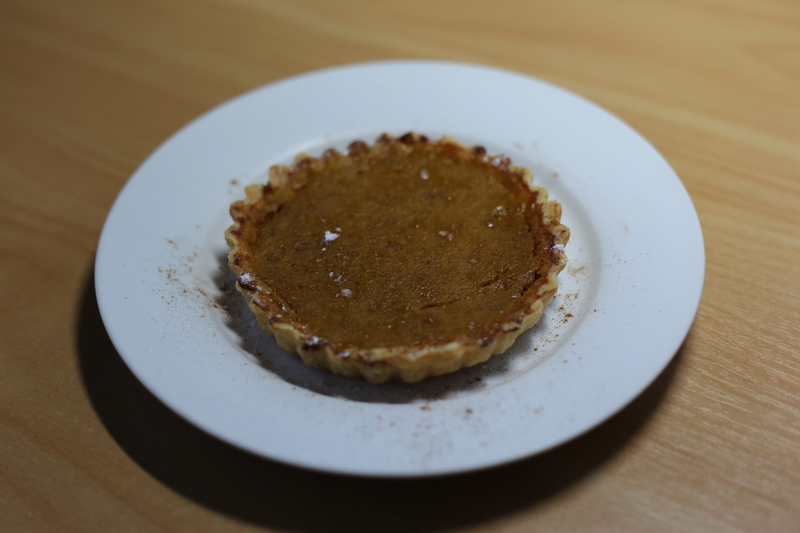 Unlike most of the other things I’ve made so far, I’ve never had pumpkin pie before. 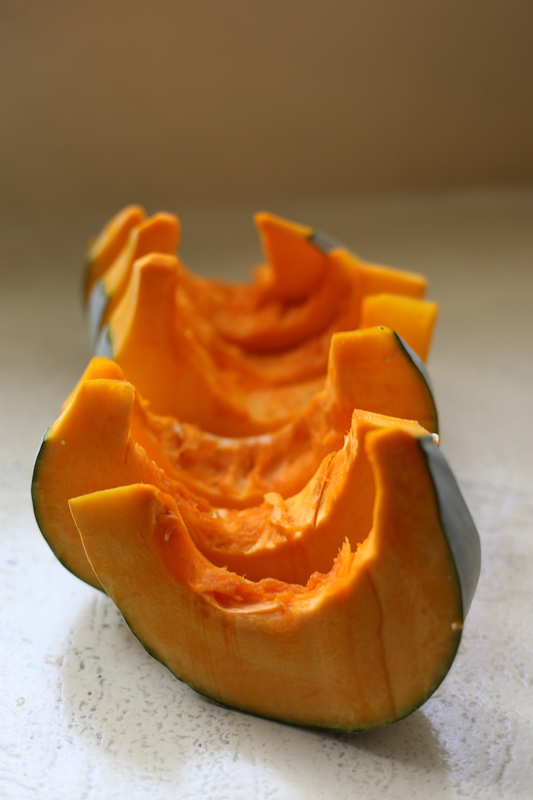 I don’t actually think I’ve ever had much pumpkin full stop. For this reason, I really felt like I was “baking blind” – all I could do was follow the recipe as best I could and trust that the result turns out as it’s meant to be. I suppose it’s a bit redundant worrying about how it should turn out because I don’t have anything to compare it with but there’s a greater sense of security, for me, that comes with knowing the taste and texture of whatever it is you’re cooking. Funny, and not in a ‘ha ha’ kind of sense, that I had trouble finding a recipe that I was happy with. I ended up mostly following this one found at BBC Good Food and followed the instructions here to making pumpkin puree from scratch. In hindsight I don’t really know why I needed instructions to puree pumpkin, it’s commonsense, really! Also, because I don’t have a large pie or tart dish handy I just used my small tart dishes and I ended up making eight really full tarts. When I was mashing the pumpkin I thought, “Why not make this harder for myself and push all of this through a sieve!” Half an hour later, I had stiff hands but very smooth pureed pumpkin. I guess it was worth the effort but I’m not sure I would have lost much sleep over it if it wasn’t completely smooth. I also made my own pastry, although I’m not quite sure I achieved short crust pastry. No matter, it tasted good and made my kitchen smell mouth-wateringly delicious when I blind baked them. I would, however, like to be able to perfect my pastry-making skills eventually, even though that’s probably highly dangerous for my waistline. The instructions I followed for the pastry can be found here. Everything went pretty smoothly and the pies tasted pretty good. I’m not sure if I would go through the trouble of making it all again but I’m definitely glad I gave it a go.